A fire that started Friday morning in a hospital emergency room in South Korea killed nearly 40 people, mainly from inhaling smoke, and injured dozens more in one of the country’s deadliest blazes in recent years. Several injured are in critical condition and the toll is feared to increase, fire officials said. Sejong Hospital in the southeastern city of Miryang had a total of 194 patients before the fire at its general medical ward and its nursing ward for the elderly. The blaze began at the general ward’s first-floor emergency room and most of the dead were from the first and second floors, the National Fire Agency official said. 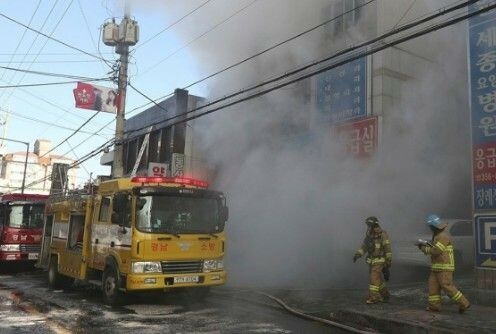 Miryang fire officials put out the blaze at 10:26 a.m.(South Korea time), nearly three hours after it started and preventing it from reaching the upper floors. The hospital’s operations were suspended after the fire. Most of the 39 deaths appeared to be due to suffocation, with only one suffering burns, said an agency official who spoke on condition of anonymity because he wasn’t authorized to speak to media. The identification of the dead was underway, he said.